Those shimmering, crystal-blue waters; white buildings; and seemingly constant sunshine are why we've been dreaming about visiting Greece for as long as we can remember. But it's the natural beauty of the country's residents that piques our curiosity about their possible skincare secrets. To uncover ancient ingredients and practices, I reached out to two experts with a deep connection to Greece. First, Athena Hewett, who owns a skincare studio called Athena Ellen in San Francisco, where she performs ancient handmade facials and creates organic skincare for her line Monastery. "I grew up spending the summers in the Greek Cyclades islands, where my family farmed an olive orchard. We pressed the olives and sold the oil for use in food and skincare. I have carried the practices of oil in skincare with me into my 30s," Ellen says. "The ancient Greeks were lovers of beauty. They were always seeking new ways to improve their appearance through nutrition, athletics, and cosmetics. The word cosmetics is actually a Greek word, kosmetikos. The word kosmetikos originated in the 17th century, so these beauty rituals have been around at least that long." Next, I spoke with Lena Korres, who founded her namesake skincare company with Greek pharmacist George Korres in 1996 out of the oldest apothecary in Athens. 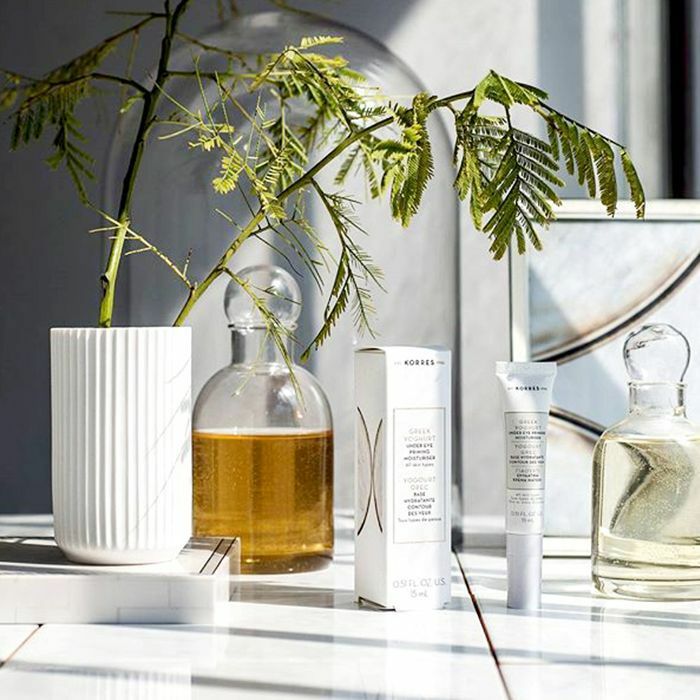 Each product in the line is "led by our belief in the power of plants, scientific discovery, and the existence of more than 3000 Greek herbal remedies," Korres says. Below find their ancient Greek skincare secrets you can still use today. "One of the most common Grecian mask preparations is to mix olive oil and honey. Honey is one of the most naturally antibacterial ingredients while olive oil is super healing," explains Ellen. "Before your bath, place 1/4 cup of honey in a short jar or bowl (adding a small amount of warm water to the honey to make the honey more spreadable). Mix 1/4 extra-virgin olive oil in with the honey. Apply with a clean paintbrush or makeup brush to your face. Let the mixture sit for 10 minutes, and remove with a washcloth." "Numerous varieties of honey are produced in Greek beehives," adds Korres, "but none of them are more renowned around the world than thyme honey. Honey, due to polysaccharides, attracts and absorbs the water molecules from the surrounding environment, acting like a sponge. In addition to its hydro-retentive properties, honey has been clinically proven to accelerate the biosynthesis and maturation of collagen fibers, so it improves skin elasticity and roughness and provides a velvety texture. Furthermore, thyme honey has a high content of vitamins, amino acids, and flavonoids, so it provides antioxidant protection and nourishes dry skin areas." In fact, honey is the main ingredient of the first Korres product—an aromatic herbal syrup with honey and aniseed. "The recipe was inspired by rakomelo, a warming spirit-with-honey concoction, which George's grandfather used to make in his hometown on the island of Naxos." "Ancient Greeks used Mediterranean sea salt mixed with olive oil to scrub and exfoliate their dry, sun-exposed bodies," explains Ellen. "Mix equal parts Epsom salt and olive oil and rub on your elbows and body parts while you soak in the bath. Let the mixture remain in your tea bath soak to provide extra detoxifying and soothing properties." "Ancient Greeks used one of their most common foods, yogurt, to dissolve dead skin and tighten the pores," says Ellen. "Yogurt is a natural form of lactic acid, so it's a natural AHA peel. Add a tablespoon of olive oil to every four tablespoons of Greek yogurt and apply to the face for 10 minutes. Your skin may tingle; these are the natural AHAs at work. Remove with a warm washcloth." "In Greece," Korres adds, "yogurt is part of daily routine. For hundreds of years, it's been the most well-known remedy that Greek mothers and grandmothers turn to for sunburn relief. A long-lived Greek tradition, which was also the inspiration for our Yogurt Cooling Gel ($26), an after-sun treatment with edible yogurt in its original form." "Ancient Greeks used dried flowers and herbs in their baths," says Ellen. "It helped to detoxify the skin, mind, and muscles. At home, grab your unused tea bags sitting in the back of your cupboard and throw them in a warm, steamy bath. Take a 20-minute soak. The tea will energize your cells. Look for green tea; it's a great antioxidant." "Ancient Greeks used their native olive tree for everything, including to hydrate and moisturize skin and hair," says Ellen. In fact, according to Korres, "Olive oil was called liquid gold by Homer, and it had an almost mythical status in ancient Greece. Ancient women of Crete used it for their hair, face, and body as it's a natural source of vitamins, minerals, amino acids, and antioxidants. It nourishes skin deeply while also locking in moisture, preventing transepidermal water loss and restoring elasticity to maintain youthful skin that is instantly hydrated, refreshed, and softened." "Put a small amount of olive oil into your hand and lightly press it onto your face," instructs Ellen. "Olive is full of omega acids and tocopherols that heal and nourish the skin." "The pomegranate has been used throughout history as a symbol of humanity's most fundamental beliefs and desires, including life and death, rebirth and eternal life, fertility and marriage, abundance and prosperity. In mythology, pomegranate is a featured symbol in the abduction of Persephone. Also, Homer refers to the pomegranate breaking, a tradition that has survived until today due to the fruit's association with life, fertility, passion, and power," explains Korres. "The pomegranate's extract is a rich source of tannins; anthocyanins; vitamins A, C, and E; and minerals," continues Korres. "It contains three times the antioxidant properties of red wine or green tea, so it's effective in combating the free radicals that cause premature aging of skin cells. It also has significant astringent properties due to its tannins content. As a result, it tightens the pores and strengthens the skin epidermis, thus being ideal for oily and combination skin." Next up: Read our (honest) review of Korres's Black Pine 3D Sculpting, Firming & Lifting Super Eye Serum.